Tile is an attractive and durable flooring surface. Tile is also easy to clean, but cleaning the grout is another matter. Because of the porous composition of grout, it is prone to staining. Kitchen tile grout is subject to drips and spills. Bathroom tile grout is susceptible to soap and mildew accumulation. First, sweep or vacuum loose dirt and debris. Check your cleaning solution by testing it in a hidden spot such as under an appliance or behind a toilet. Use the mildest cleaner first before resorting to a harsher solution. Spray warm water on the tile grout. Use a stiff-bristled brush, old toothbrush or electric toothbrush to scrub the grout. For heavier grime, make a paste with baking soda and water. Use the paste to cover the tile grout lines. Fill a spray bottle with equal parts warm water and white vinegar. Spray the vinegar solution on top of the paste. Wait a few minutes before scrubbing with a brush. An alternative cleaning solution can be made using equal parts Dawn dish detergent and white vinegar. Heat the vinegar for 1 minute in the microwave. Combine the dish detergent and vinegar in a spray bottle. Shake to combine the mixture. Lightly spray the solution onto your grout allowing it to sit for a few minutes. Scrub if necessary. Use powdered oxygen bleach for tough stains. Mix 1 tsp. of powdered oxygen bleach with two cups of warm water. Stir until it dissolves. Apply the solution to the grout lines and let sit for up to 30 minutes. Scrub lightly as needed. No matter the solution you use, remove the dirty water using a shop vacuum. Rinse with plain hot water to remove any residue. Vacuum that water too. 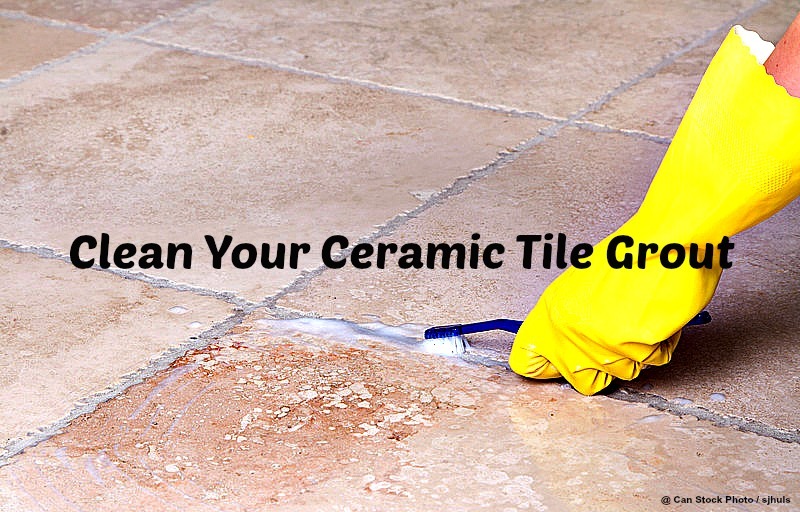 Use a steam cleaner to clean tile grout. Pressurized steam can sometimes clean tough stains from grout. Refrain from using bleach, ammonia, lime or mineral scalers. They can damage grout. Do not use wax or oil-based cleaners as they will leave a film on your tile floor and grout. Caution should be used with natural stone such as travertine, marble or granite that are softer and porous. Use a specialized stone cleaner and a soft cloth rather than stiff brushes and the cleaning solutions mentioned above. Keep your tile floors and grout beautiful by sealing the grout. Topical sealers cover the grout surface but may provide a plastic appearance. Penetrating sealers are durable but also more expensive. For help in selecting a sealer, ask for assistance at your local flooring store or big box home store.